common name for the Lauraceae, a family of forest trees and shrubs found mainly in tropical SE Asia but also abundant in tropical America. Most have aromatic bark and foliage and are evergreen; deciduous species are usually those that extend into temperate zones. common name for plants of the genus Magnolia, and for the Magnoliaceae, a family of deciduous or evergreen trees and shrubs, often with showy flowers. They are principally of north temperate regions with centers of distribution in Asia and E North America. 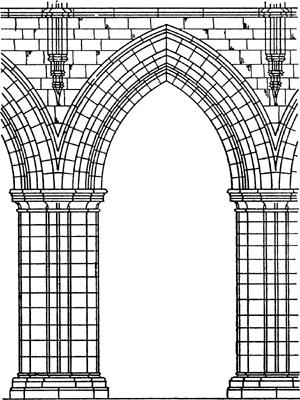 A principal compartment or division in the architectural arrangement of a building, marked either by buttresses or pilasters in the wall, by the disposition of main arches and pillars, or by any repeated spatial units that separate it into corresponding portions. A bay erected on a canted outline. Seasonal decorations of greenery have embellished European Christmas celebrations for centuries. Laurel's association with the season can be traced back even further, however. The Romans celebrated their new year festival, Kalends, by adorning their homes and temples with evergreen branches. Both the Greeks and the Romans crowned the victors of their athletic and other contests with wreaths of laurel, since the laurel branch served as a symbol of victory. In later times northern Europeans gathered laurel, or bay, for their Christmas garlands. In the seventeenth century the English poet Robert Herrick (1591-1674) noted that, according to local custom, "Rosemary and baies [bays] that are most faire were stuck about the houses and the churches as Christmas decorations." Christian authorities explained this use of laurel with reference to its ancient association with victory, declaring that when used in Christmas trimmings the fragrant leaves represented the triumph of Jesus Christ. Crippen, Thomas G. Christmas and Christmas Lore. 1923. Reprint. Detroit, Mich.: Omnigraphics, 1990.
a small part of a sea, gulf, lake, or reservoir separated from open water by areas of dry land. Local conditions determine the hydrological characteristics of a bay, which differ somewhat from the characteristics of the nearby waters. Usually bays form good harbors for vessels (Gelendzhik and Novorossiisk bays in the Black Sea, the Golden Horn in the Bosporus Strait, and other bays). What does it mean when you dream about a bay? A body of water often represents the unconscious, so the shoreline of a bay indicates the threshold between conscious and unconscious. As an open semi-circle, a bay can also represent female sexuality. Additionally, it might refer to idioms such as to “keep one at bay.” (See also Beach). A space formed by structural partitions on an aircraft. Division of a building between adjacent beams or columns. Laurus nobilis. An evergreen tree of the laurel family. One segment of an antenna array. A housing used for equipment. A body of water, smaller than a gulf and larger than a cove in a recess in the shoreline. A narrow neck of water leading from the sea between two headlands. A simple transient magnetic disturbance, usually an hour in duration, whose appearance on a magnetic record has the shape of a V or a bay of the sea. 1. Within a structure, a regularly repeated spatial element defined by beams or ribs and their supports. (As in an aeroplane "cargo bay") A space in a cabinet into which a device of a certain size can be physically mounted and connected to power and data. Common examples are a "drive bay" into which a disk drive (usually either 3.5 inch or 5.25 inch) can be inserted or the space in a docking station where you insert a notebook computer or laptop computer to work as a desktop computer or to charge their batteries, print or connect to the office network, etc.